Who is Sultan Muhammad Abuljadayel, the man who has just bought a 30% stake in the Independent online newspaper? He is a rich man who wants to be richer, in short; and a Saudi investor seeking influence. Money and influence are the two main reasons that people invest in media, and there's no reason to think Abuljadayel is any different. Like Evgeny Lebedev, the majority owner of the Independent and the London Evening Standard with whom he is now a partner, Abuljadayel inherited his wealth. The 42-year-old Saudi hails from a family with huge international property investments, and I am told he is not a member of the Saudi royal family or government. But in a theocracy where all roads lead back to the House of Saud, the links between Abuljadayel and a monarchy whose reformist noises cannot conceal an appalling record on human rights will now come under the spotlight. I have already been contacted by staff at the Independent - who are on the whole young, internationalist, and liberal in outlook - discomforted by the principle of a Saudi investor. Their concern is naturally over "editorial restrictions as to what we could run". This would be true of any investor, of course. But the Saudi connection will prove especially troublesome to several staff, not least young female writers disgusted by treatment of women in that country. The deal, concluded in June, has been structured to allay concerns about editorial independence. He will have no place on the Board, and guarantees have been written into the Shareholder Agreement. Evgeny Lebedev retains 41%; Justin Byam Shaw, an entrepreneur, will have 26%; and a few other minor shareholders make up the rest. The Independent is known around the world for its coverage of the Middle East, led by Patrick Cockburn, Robert Fisk and Kim Sengupta. It opposed the Iraq War and has been ferocious in its condemnation of the Saudi regime - including during the time that this deal was in the works. Expect a big anti-Saudi story in the next few days to prove the independent credentials of the publication. The Independent newspaper - of which I was editor between June 2013 and its closure last March - was founded by idealists who wanted an upmarket, centrist paper free from editorial interference. Goodness know what they would have made of the modern publication, a left-wing multi-platform digital title, pursuing a viral social media strategy with frequently salacious stories, whose main owners are the son of a former KGB economic attaché and the scion of Saudi property owners. And yet, while the paper - which Rupert Murdoch targeted in a brutal 1990s price war - was bedevilled by financial problems, the website is now profitable and valued at around £100m. That was simply unimaginable even five years ago. Back then, the paper was losing around £17m, and its horror-filled path to profitability was a combination of price rises (including on the sister paper, The I, subsequently sold to Johnston Press) and cost savings across editorial, production and distribution. Full disclosure: I was responsible for delivering some of the latter. Now the distribution costs don't exist, because the bizarre and expensive ritual of printing things on paper, putting it in lorries, and driving it to shops around the country has been eradicated. And unlike, for instance, the Guardian, the Independent retains few of the senior, expensive and highly experienced staff of old. The new staff, while talented and digitally savvy, are on average younger and cheaper too. 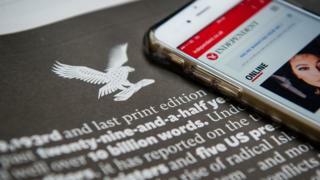 Many newspaper groups try to ride two horses: both print and digital. The Independent, which has innovation in its DNA - it was the first title to go compact, and launched that brilliant sister title in 2010 - decided to abandon one horse altogether. Other publications will wonder whether the commercial revival of the Independent suggests they should consider following the same strategy. It's not always clear that they should. First of all, the Independent online is a very different beast to the paper, and frequently publishes articles that would never have got close to the print version. Second, the newspaper's circulation was so low towards the end, that its print revenues - while vital - could quickly be supplanted by digital revenue growth. That is not yet true of somewhere like the Guardian, the Financial Times or the Daily Mail, for whom print revenues remain vast. And third, moving to the much lower cost base of a younger editorial staff involves a huge amount of pain - including extensive redundancies - that many titles, and executives, just won't have the stomach for. The huge injection of cash in the Independent will now be used to fund long-promised international expansion, with Urdu and Arab language services being explored. One third of revenues at the title come from the US, where the anti-Trump wave has been a boon. That's why I called him a saviour of the media. Within a few years, the business will be predominantly US-focused. In terms of the short-term needs of ESI Media, the group which The Independent is part of (together with the Standard and television station London Live), this is precious cash for another reason. It used to be the case that the Independent was loss-making, while the Standard was profitable. This was always susceptible to misinterpretation both inside and outside the company, because it wasn't a verdict on the relative quality of the titles: it just so happened that the Standard's business model, in which it had become a free title under the Lebedevs, was successful. No more. The Standard, where George Osborne is editor, now faces terrifying commercial realities. Print display advertising provides almost all of the roughly £70m in revenues at the paper (whose website is much smaller than the Independent). That is likely to fall to around £65m this year - which is why I have been making the point repeatedly here that Osborne's task is as much commercial as editorial. For those who worked at the Independent in its long and proud history, a situation where Russian and Saudi money are used to fund not just international growth at the title, but the ambitions of a Tory ex-Chancellor now installed in the editor's chair of a sister title is, well, a long way from what the founders intended. They could be forgiven a wry smile today. For staff at the title, the initial surprise will give way to a mixture of relief at their new wealth and concern about its origins.